The role of values in developing and managing service companies has been under researched in the existing literature - until now. This book analyzes a large organization (IKEA) as a basis for values based service for sustainable business. The authors provide an overview of the history of IKEA and the social and environmental perspectives that have acted as driving forces for creating economic value. They go on to develop values-based service thinking within the areas of service experience, service brand, and service leadership. 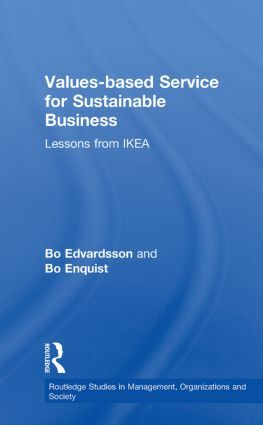 The book concludes by comparing IKEA to other values-based service companies (such as Starbucks, H&M, and Body Shop); from these reflections, the book presents the key principles for a sustainable, values-based service business.